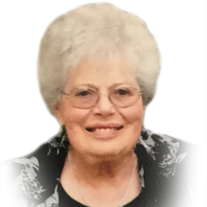 Mary Patricia Wright Jensen (Pat) passed away Monday, February 4, 2019 with her family by her side. She was born March 19, 1929 in Hyrum, Utah to John Howard and Ophelia Lewis Wright. She graduated from South Cache High School in 1947 and Utah State University in 1951. Pat married Reed C. Jensen on June 8, 1951 in the Logan LDS Temple. They lived in Morgan, Utah for two years and then moved back to Hyrum. Pat worked for the Cache County School District for 36 years until retirement at age 62. Pat was a member of the Church of Jesus Christ of Latter-day Saints and served faithfully in many ward and stake positions. Pat and Reed served two LDS missions together, one at the Family History Center in Logan, and one in Nashville, TN. Pat was a member of the American Legion Auxiliary and the Daughters of the Utah Pioneers. She loved serving people and for the last ten years hosted humanitarian quilting projects in her home the first Thursday of every month. Pat is survived by her children, Cathy (Reed) Robinson, Orem, Dave (Jan) Farmington, Sue (Mike) Thompson, Smithfield, and Kurt (Lisa), South Jordan; 20 grandchildren and 22 great-grandchildren. She was preceded in death by her husband Reed C. Jensen, a brother John K. Wright, and a sister Jacqueline White. Funeral services will be held Saturday, February 9, 2019 at 11:00 am at the Hyrum Stake Center, 595 South 200 East in Hyrum. Friends may call from 6 to 8 pm Friday evening at Allen-Hall Mortuary, 34 East Center in Logan, and from 9:30 to 10:30 am on Saturday prior to funeral services. Interments will be in the Hyrum City Cemetery. In lieu of flowers, donations can be made to the Hyrum 8th Ward Humanitarian Fund. The family would like to thank the entire staff at both Maple Springs Skilled Nursing and Blacksmith Fork Assisted Living for their love and care of Mom during her stays there. We would like to thank Hospice and the tender care Linzee and Bradley showed our mother at her passing. We are especially grateful for the loving care Cynthia McBride, her family, and other ward members gave our mom after the passing of our dad.